Three turbines of the Block Island Wind Farm stand offshore of Block Island, Rhode Island, August 15, 2016. Leadership by governors and lawmakers in Rhode Island, Massachusetts, and New York demonstrates how key reforms can drive private investment in an abundant, climate-safe resource. In contrast, the Block Island Wind Farm, a 30-megawatt facility in Rhode Island state waters, began commercial operations in December 2016, becoming the first such power plant in the United States. As explained below, this remarkable accomplishment is due almost entirely to progressive energy policy reforms, marine spatial planning, and focused political leadership within the Rhode Island state government. In other words, state-level policy will continue to play an essential role in the realization of a thriving commercial offshore wind industry and in the realization of the resource’s potential as an economic and environmental asset of national significance. In each state, the private sector has responded to these states’ policies with significant, concrete investments and actions toward commercial development. Policymakers in other U.S. coastal states now have a ripe opportunity to provide what may be the final push needed to bring commercial offshore wind development to fruition and begin capturing the industry’s economic and environmental benefits. This report provides an overview of the case for state government action to foster the fledgling domestic offshore wind energy industry and surveys the origin, implementation, and impact of offshore wind policy in three states—Rhode Island, Massachusetts, and New York. These states serve as exemplary cases for other coastal states endowed with access to this abundant, climate-safe, renewable resource. Strong renewable energy requirements: Renewable energy mandates, which require states’ utilities to supply at least a certain minimum proportion of electricity generated from renewable sources, underpin all three states whose offshore wind energy industries are rapidly progressing. In all three states, policymakers have increased these renewable energy standards over time. Legislation that guarantees demand for offshore wind: Laws that guarantee demand for offshore wind energy—often called offshore wind “carve-outs”—played a critical role in the realization of the Block Island Wind Farm and the influx of investor and developer interest in Massachusetts’ offshore wind industry. Comprehensive ocean planning: Rhode Island and Massachusetts both completed comprehensive ocean plans in advance of offshore wind development. This planning was vital for Rhode Island to become home to the nation’s first commercial wind farm, suggesting that it may be essential to accommodate a major new offshore industry without harming existing ocean users, degrading the environment, or provoking conflict and litigation with coastal stakeholders. Fair consideration of costs: Rhode Island and Massachusetts have passed legislation that sets the terms for public utilities commissions to evaluate offshore wind project proposals. These allow a given proposal’s advantages and costs to be properly and transparently accounted for, without being unfairly compared with the costs of obsolete or carbon-intensive energy sources. Require long-term contracts for competitive proposals: Rhode Island and Massachusetts passed laws that require utilities to enter into long-term contracts, known as power purchase agreements, with offshore wind projects assessed to be competitive and reasonable. Such contracts incentivize developers to compete, provide developers access to private sector finance to complete approved projects, and can support long-term price stability for ratepayers. Investment in infrastructure: The state of Massachusetts made significant public investments in needed port infrastructure in the city of New Bedford, with the goals of spurring offshore wind development in the state and capturing the employment and other economic benefits of supply chain development. Recent moves by industry to locate in New Bedford indicate that developers took notice. Executive leadership, which can drive significant progress: New York, unlike Rhode Island and Massachusetts, has stimulated significant private-sector investment and activity without dedicated legislation, instead relying on a comprehensive strategy, public investments in planning, and the formalization of policy through regulatory action—all executed by the state’s executive branch. In Rhode Island, strong executive branch leadership played an essential role in the establishment of key policies and in the completion of the nation’s first commercial wind farm. Offshore wind presents coastal state policymakers with profound opportunities to capitalize on an abundant clean energy resource and fill the leadership vacuum that now exists at the federal level for facing the global climate crisis. By studying, formulating, and implementing policies such as those identified in this report, coastal and Great Lakes states may be able to replicate the remarkable progress in the development of offshore wind achieved by Rhode Island, New York, and Massachusetts and begin reaping the economic and environmental dividends. Furthermore, offshore wind energy development would also advance the efforts of American states and cities that are seizing the mantle of U.S. global climate leadership. After the Trump administration announced its intention to withdraw the United States from the Paris Agreement, myriad state and local leaders have coalesced to sustain the U.S. commitment made by the Obama administration—a 26 percent to 28 percent reduction in greenhouse gas emissions from 2005 levels by 2025.11 For example, more than 200 cities and 9 states, including North Carolina, have joined businesses and universities across the country to form We Are Still In, the largest national coalition in support of the Paris Agreement.12 Meanwhile, Govs. Jerry Brown (D-CA), Jay Inslee (D-WA), and Andrew Cuomo (D-NY) launched the U.S. Climate Alliance, which now has 13 member states plus Puerto Rico.13 Because 12 of the 14 Climate Alliance members lie along Pacific, Atlantic, or Great Lakes coasts, offshore wind could represent a major component of the group’s efforts to achieve substantial greenhouse gas emissions reductions. Finally, mounting evidence indicates that offshore wind is rapidly becoming economically competitive in major urban electricity markets. Offshore wind is overcoming once prohibitive capital costs that were long considered the foremost obstacle to development in the United States. In 2014, European offshore wind reached a tipping point, and since then, costs have fallen sharply. Private analysts in early 2016 foresaw reductions in the levelized cost of offshore wind energy—the production cost per unit of energy over the lifetime of a given wind farm—of around 30 percent to 33 percent by 2030, relative to a median baseline of $169 per megawatt-hour in 2014.24 However, evidence from several countries suggests an even steeper decline in production costs is already being realized. For comparison with common existing U.S. energy sources, the U.S. Energy Information Administration estimates that for domestic commercial projects developed for completion in 2022, average production costs before federal tax credits will average $55.80 per MWh for onshore wind and $66.30 per MWh for solar photovoltaic.32 Conventional combined-cycle natural gas power plants are projected to produce electricity for $58.60 per MWh by 2022.33 Although European and American offshore wind development costs can certainly be expected to differ, particularly while the U.S. industry builds up the necessary port infrastructure needed to stage offshore-wind turbine installation, the European industry today is demonstrating that offshore wind energy can compete on economic terms with other major energy sources, even without accounting for the other strategic benefits that it can provide. In recognition of these benefits, the governments of several Northeastern states are taking major steps to make offshore wind part of their clean energy portfolios. Rhode Island, New York, and Massachusetts have each pursued distinct policy pathways to spur private-sector investment in commercial offshore wind energy development, with growing evidence of success. A survey of these approaches may help other coastal state governments formulate their own strategies in pursuit of the benefits of offshore wind energy. On December 12, 2016, Deepwater Wind LLC’s five-turbine, 30-megawatt, $290 million Block Island Wind Farm offshore of Rhode Island officially completed post-construction testing and validation and commenced commercial electricity delivery to the state’s power grid, becoming the first such facility in the United States.34 The project’s commencement ended decades of highly polluting and expensive diesel-powered generation within the community on Block Island and rewarded Rhode Island’s policymakers for years of work to make their state the U.S. offshore wind power leader. Three state policies embody those efforts: the Renewable Energy Standard (RES), which established clean energy use requirements; the Ocean Special Area Management Plan (SAMP), which produced a comprehensive ocean plan protecting existing resources and uses of the ocean areas under the state’s jurisdiction; and the Long-Term Contracting Standard for Renewable Energy, which mandates power purchase agreements with clean energy developers and creates specific mechanisms for offshore wind. The establishment of each policy required significant leadership and sustained political will from Rhode Island’s executive and legislative branches of government, which together formed a three-part policy foundation for Rhode Island to launch its new offshore renewable energy industry. According to Deepwater Wind officials, the Ocean SAMP accelerated project development and minimized opposition from other ocean stakeholders that lived and worked around the project area.48 The Ocean SAMP also laid the groundwork for future offshore wind development on the federal Outer Continental Shelf beyond the state waters of both Rhode Island and Massachusetts; this is discussed in the following section on Massachusetts state policy. In 2009, in parallel with the development of the comprehensive marine spatial plan, the state legislature also passed the Long-Term Contracting Standard for Renewable Energy, a state law establishing three important provisions for the state’s utilities relative to the launch of the offshore wind industry. In sum, Rhode Island successfully set the table for commercial offshore wind development through a combination of policy support for clean energy; comprehensive ocean planning that formally integrated the equities of stakeholders, pre-empted conflicts, and mapped resource availability; and political leadership to adapt the state’s utility policy to accommodate the unique features of the new energy resource embodied in offshore wind. These policies clearly facilitated the successful development of the Block Island Wind Farm and therefore ought to be closely considered by other states looking to launch offshore wind industries. Like Rhode Island, Massachusetts laid the foundation for development of its abundant offshore wind energy supply through the passage of renewable portfolio standards and comprehensive marine spatial planning. However, Massachusetts’ current policy regime for offshore wind is distinguished by additional factors, including hard lessons learned from the perhaps quixotic Cape Wind project, a looming clean energy supply shortfall, public support for dockside infrastructure, and a newly passed offshore wind policy indicating that the state’s lawmakers are eager to claim the leadership that currently rests with Rhode Island. These lessons and policy mechanisms should be scrutinized by other states considering the development of offshore wind resources. 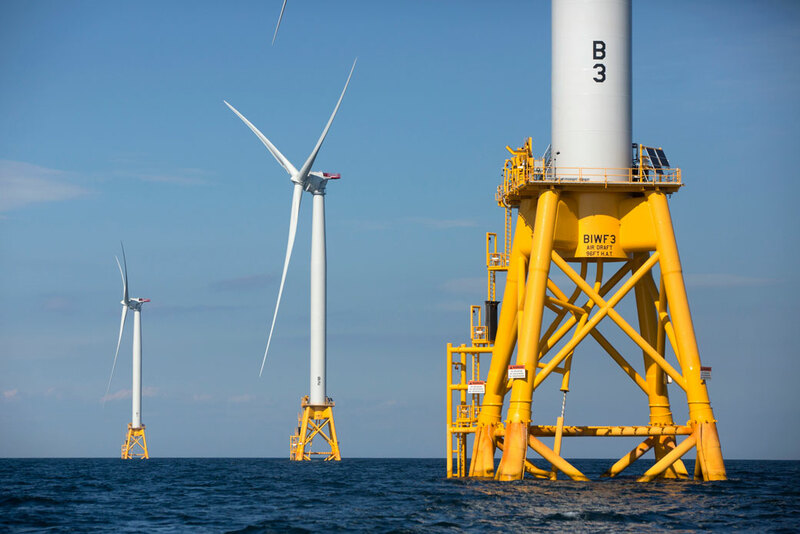 Irrespective of Cape Wind’s fate, Massachusetts policymakers and appropriators have taken additional significant steps to facilitate offshore wind development. These actions are already driving millions of dollars in private investment by multiple firms and promise the delivery of vast new energy supplies from federal offshore wind leases. In short, as of early 2016, utilities and policymakers faced a looming shortfall of clean energy projects in the pipeline, with respect to both state clean energy requirements and overall electricity supply. On August 8, 2016, Massachusetts Gov. Charlie Baker (R) signed into law a bill titled An Act to Promote Energy Diversity that state legislators crafted and passed on a bipartisan basis to address the emerging clean energy shortfall.68 Along with provisions to support energy efficiency measures, long-term contracts for all clean energy sources, and the procurement of imported hydroelectric power, the law, often referred to as the Energy Diversity Act, established a new dedicated offshore wind requirement for the state’s electric power distribution companies. The Energy Diversity Act also included features to control costs, foster efficiency and competition among offshore wind developers, and capture other economic benefits. First, each of Massachusetts’ retail electricity suppliers are required to solicit a minimum aggregate of 400 megawatts of offshore wind generation capacity for long-term contracts. This scale approaches that of some of the largest in Europe, including the aforementioned Danish and Dutch projects, at 600 megawatts and 700 megawatts, respectively, that won bidding processes with previously unheard of low bids. Both the scale of the procurement requirement and the competitive bidding process established by the law support market development in Massachusetts, providing a vehicle for developers to achieve economies of scale and invest in a domestic supply chain while also being exposed to competition. Second, the law requires that after each proposal by a developer for a power purchase agreement is approved by the state Department of Public Utilities, subsequent projects will not be approved unless they propose a production cost that is less than the previously approved project.72 This component could stimulate investment and competition in the short term, and provides distribution companies and ratepayers with a statutory bulwark for price stability over the longer term. Perhaps even more novel than the storage component, however, is that Deepwater’s proposal was submitted not to compete with other offshore wind energy projects within the framework of the Energy Diversity Act’s offshore wind carve-out but rather to be considered for a long-term power purchase agreement under a separate provision of the law that requires procurement contracts for competitive commercial scale projects of all clean energy sources, including onshore wind and solar.81 While expected production costs for Revolution Wind were not disclosed in the public materials for the project, and it remains to be seen whether it will in fact be directly competitive with other renewable energy technologies in 2017, Deepwater’s willingness to fully develop and submit a bid that goes head-to-head against other, more established renewable energy technologies suggests that the company has accrued significant confidence in its ability to achieve dramatic cost reductions on a timescale well ahead of most independent predictions. In 2008, the Massachusetts state legislature passed the Oceans Act,82 which required the state government to develop a comprehensive ocean plan for state waters to serve as a “blueprint for the protection and sustainable use of state ocean waters” that “protects critical marine habitat and important water-dependent uses and sets standards for new ocean-based development.”83 The Oceans Act also requires that the ocean plan be revised and updated as needed every five years. In accordance with the law, the state completed its first ocean plan in 2009, followed by a major revision and update to the plan in January 2015.84 As a state initiative, the ocean plan’s geographic extent is largely limited to waters of state jurisdiction, generally those within three nautical miles of shore.85 Consequently, the ocean plan is not directly relevant to the siting of the offshore wind farms that will fulfill the state’s Energy Diversity Act. Though a seemingly minor component of offshore wind development, the delineation and public release of these four potential transmission routes in the 2015 ocean plan represent a concrete example of the value of ocean planning. Developers gain increased certainty and a clearer path toward necessary permits, while existing ocean stakeholders and the public gain reduced risk of unintended environmental or economic harm. Driven by a short-term need to diversify the state’s energy supply, a recognition of the long-term need to decarbonize it, and a commitment to secure the potential economic benefits of a major new industry, Massachusetts lawmakers formulated what is now the United States’ most aggressive approach to fostering a commercial offshore wind industry within their state to serve energy consumers statewide. Based on a statutory mandate that sets a minimum for offshore wind’s energy production, a comprehensive ocean-planning regime to facilitate offshore construction, and proactive public investment in port infrastructure, the state has laid a policy groundwork that is beginning to yield dividends in the form of burgeoning competition among major international players in the offshore wind industry, as well as local management and supply-chain development investments. Should this magnitude of decrease in costs be realized, it would accord with the performance of the European market, while serving Massachusetts’ ratepayers and rewarding Massachusetts policymakers whose initiatives fostered the offshore wind build-out. In contrast to Rhode Island and Massachusetts, New York’s multipronged offshore wind policy has flowed almost entirely from the state’s executive branch, specifically the administration of Gov. Andrew Cuomo. To date, the Cuomo administration’s strategy also differs from the other two states in that the government’s near-term objective is to reduce the initial costs and risks of offshore wind development by funding and carrying out a series of specific predevelopment activities, such as environmental studies and wind resource assessments for use by developers, rather than begin with statutory offshore wind power-demand guarantees. The range of these activities, which other states could emulate to attract investment in offshore wind development, is outlined below. While unilateral administrative action to drive a locally untested new energy source may seem risky, the Cuomo administration’s aggressive approach is motivated by several key factors that imply the policy has significant durability. So far, the Cuomo administration’s plan to meet this capacity goal—equivalent to installing 400 turbines of the type currently spinning off Block Island—involves multiple, interwoven initiatives using existing legal authority aimed at reducing development risks and costs, guaranteeing long-term demand for generated power, and preventing conflicts with ocean stakeholders and environmentally sensitive areas. The Cuomo administration’s capacity to deliver on these aims and fulfill the grand goal remains to be seen. However, its first concrete steps have already begun to mobilize tens of millions of dollars in public and private capital for offshore wind development to serve New York state. Because these measures may be replicable by other coastal states, they are reviewed below. In early 2016, NYSERDA received approval from the New York Public Service Commission to invest $15 million from the state’s Clean Energy Fund to develop the institutional knowledge, baseline data, and bureaucratic mechanisms to facilitate private-sector delivery of offshore wind energy in federal waters to New York’s electricity consumers. NYSERDA outlined a multitude of activities to be completed as part of the master plan process, including environmental and economic studies, mapping and planning, and public hearings. Specifically, the agency intends for the master plan to include several core categories for research, preliminary policy development, and public engagement. First, NYSERDA aims to complete several specific studies to identify offshore wind power development sites in federal waters, and conduct preliminary mapping of existing uses and risks. According to its proposal, this includes maritime, aviation, and security risk assessments; mapping of historic, cultural, and coastal view resources; and commercial and recreational fishing assessments and essential fish habitat studies. A key component of this research, however, is to identify the data gaps that require new site-specific data gathering activities, such as wildlife distribution and wind patterns, that private-sector developers would need to accelerate siting, design, permitting, and completion of offshore wind projects. A second category of master plan activities centers on the development of state utilities policy—such as cost, benefit, and interconnection studies—and the formulation and analysis of specific mechanisms for energy offtake from offshore wind facilities and electric power distributors. The third category of activities in the master plan captures NYSERDA’s strategy to engage the array of affected New York stakeholder groups, such as the fishing industry, environmental advocates, the maritime community, industry, tribes, intergovernmental partners, and rate-paying residents and businesses. The agency outlined a series of public hearings and education and targeted outreach events. Outreach to two groups will be of particular importance. First, NYSERDA identified engagement with the utilities that will receive and distribute offshore wind energy—namely the Long Island Power Authority (LIPA), Con Edison, and the New York Power Authority—as a core component of outreach within the master plan development process. Formulation of the policy mechanisms by which utilities will procure electric power from offshore wind farms will be perhaps the most important output of the master plan process; accordingly, careful coordination with the utilities will help ensure success. Second, blocs of the region’s fishermen have strongly voiced concerns about offshore wind development, fearing that development will degrade critical habitats or lead to exclusion from traditional fishing grounds.117 On February 8, 2017, two fishing trade groups sued in federal court for a preliminary injunction to halt the Bureau of Ocean Energy Management’s planning efforts for an offshore wind energy area south of western Long Island that was originally proposed for development by the state of New York.118 Days later, the presiding judge declined to issue the injunction, on the basis that BOEM’s planning and permitting activities were not causing demonstrable harm to the industry.119 Nevertheless, the litigation underscores the importance of state government outreach to the fishing community and rigorous inclusion of their input into the formulation of offshore wind planning. The second core phase, for which NYSERDA received approval to invest the remaining $10 million authorized by the New York Public Service Commission, involves carrying out the broad range of site-specific research and data gathering activities needed to fully characterize the resources and the environment in the federal waters areas where offshore wind could be developed and to fill the data gaps identified in the master plan. NYSERDA refers to this phase as “pre-development activities,” which are intended to culminate with the full public release of all accumulated resource and environmental data for use by developers and other stakeholders.122 Expenditures for predevelopment activities are scheduled to conclude in 2018, implying a 2019 release to the public and to private developers of the collected data. In addition to the Offshore Wind Master Plan process, the state government has undertaken specific proactive initiatives to kindle the state’s offshore wind industry and signal to the private sector that New York’s burgeoning demand for offshore wind is both real and for the long term. NYSERDA publicized its intention to be “in it to win it,” with respect to BOEM’s auction for the offshore wind leases.130 After 33 rounds of competitive bidding among five different entities, however, a U.S.-based subsidiary of Norwegian oil giant Statoil, which had begun investing in offshore wind energy facilities in Europe, won the offshore wind lease with a bid of $42,469,725.131 Both the vigor of competition and the magnitude of the winning bid were unprecedented in the history of BOEM’s offshore wind program, indicating an internalization by the private sector of the state’s positive demand signals. The aggressive and successful procurement of development rights by a deep-pocketed, experienced offshore energy developer, as well as the successful pursuit of approval of a major new project by America’s only established offshore wind energy developer, bodes well for New York’s approach. It suggests that the Cuomo administration’s executive branch-driven—but comprehensive—strategy is a sufficiently strong signal to the private sector that the state is ready and willing to buy offshore wind energy from commercial developers. The legislatures of both Rhode Island and Massachusetts helped launch offshore wind development within their states through the passage of statutes that guarantee demand for the output from offshore wind projects—what many advocates and policymakers perceived as an essential signal to developers and financiers who must overcome tremendous startup- and supply chain-development costs to move forward with America’s first commercial offshore wind projects. Through the creative application of several existing policy tools, however, the Cuomo administration appears to be succeeding in stimulating the private sector to make significant investments in offshore wind development in the federal waters off the Empire State, through executive branch regulations and initiatives alone. While one governor’s policies and commitments may seem less durable than state law, in this case, they are well integrated with the state’s overall greenhouse gas emissions reduction strategy; an approved $15 million investment to fund resource assessments, planning, and other activities to reduce developer risk; and formal approval of a long-term power purchase agreement to greenlight a specific 90-megawatt project in federal waters. Perhaps most importantly, upon completion and approval by the New York Public Service Commission, the New York Offshore Wind Master Plan will have the force and durability of regulation, at which point the state will join Rhode Island and Massachusetts as an electricity market with a legally binding offshore energy requirement. Cumulatively, these actions have stimulated record-setting private-sector investments that suggest special legislation may no longer be required for a state to launch offshore wind energy. Nevertheless, estimates of the readily available wind resources offshore of both states range well into the gigawatts,139 indicating that should forward-looking political leadership materialize, the two states could unlock massive new clean energy supplies and the associated private investment and job creation. When considered together, the policy experiences of the three states discussed in this report comprise a policy toolkit that could be of significant value to other coastal states that wish to capitalize on their offshore wind resources. That toolkit includes the following elements. Strong renewable energy requirements: Renewable energy mandates serve as a policy baseline for all three states, whose offshore wind energy industries are rapidly progressing. In all three states, policymakers have increased these renewable energy standards over time. In part, such portfolio standards prevent an unfair cost comparison between new offshore wind energy generation and legacy fossil fuel generation, for which production costs are often artificially low due to depreciated physical capital and a lack of direct pricing of carbon emissions. At best, renewable power mandates provoke critical evaluation of the relative merits of different clean energy supplies, such as the time-of-day production profile differences between solar and offshore wind. Analysis of these differences can then help policymakers enact further reforms that maximize supply diversity, rate stability, and other important benefits for each state’s energy consumers. Legislation that guarantees demand for offshore wind: Establishing legislatively guaranteed demand for offshore wind energy—often called an offshore wind carve-out—played a critical role in the realization of the Block Island Wind Farm and underpins the influx of investor and developer interest in Massachusetts’ offshore wind industry. However, it should not be viewed as a panacea due to the host of challenges associated with situating massive new industrial facilities within the marine environment. Comprehensive ocean planning: Rhode Island and Massachusetts both completed comprehensive ocean plans in advance of offshore wind development. This planning was vital for Rhode Island to become home to the nation’s first commercial wind farm, suggesting that ocean planning may be essential to accommodate a major new offshore industry without harming existing ocean users, degrading the environment, or provoking conflict and litigation with coastal stakeholders. When states work with federal, local and tribal partners to map out existing ocean uses, resources, habitats, and other important economic, ecological, and cultural features of the marine environment, they facilitate development of offshore wind energy development and other future economic activities by pre-empting illegal development, conflicts, and public antipathy. Fair consideration of costs: Rhode Island and Massachusetts lawmakers both passed legislation that sets the terms for public utilities commissions to evaluate offshore wind project proposals, so that a given proposal’s advantages and costs are properly and transparently accounted for without being unfairly compared with the costs of obsolete or carbon-intensive energy sources. Focus on market development: While supportive policies are needed in the short term, states should simultaneously structure their offshore wind programs to foster market development. Massachusetts’ competitive bidding process already appears to be delivering valuable market impacts, with world-leading developers competing on price and additional benefits such as in-state supply chain development and deployment of battery-based storage. Requirement of long-term contracts: Rhode Island’s and Massachusetts’ offshore wind laws require utilities to enter into long-term contracts, known as power purchase agreements, with offshore wind projects assessed to be competitive and reasonable. Such contracts incentivize developers to compete, provide access to private-sector finance to complete approved projects, and can support long-term price stability for ratepayers. Investment in essential infrastructure: Under the leadership of then-Gov. Deval Patrick, the state of Massachusetts made significant public investments in port infrastructure in the city of New Bedford, with the goals of spurring offshore wind development in the state and capturing the employment and other economic benefits of supply chain development. In combination with the state’s offshore wind carve out, this infrastructure has attracted significant commitments from major developers for both management and construction jobs in New Bedford. Executive leadership, which can drive significant progress: New York, unlike Rhode Island and Massachusetts, has stimulated significant private-sector investment and activity without dedicated legislation, instead relying on a comprehensive strategy, public investments in planning, and the formalization of policy through regulatory action—all executed by the state’s executive branch. While dedicated state law provides arguably the clearest signal to investors of a state’s desire for offshore wind energy, New York has shown that a combination of public investment in market development and planning, a robust clean energy standard, and focused political leadership can deliver substantial private investment and long-term contracts with developers. Offshore wind remains a nascent industry in the United States, but the environmental and economic case for harnessing this strategic resource becomes stronger by the day. With the current lack of leadership from the federal government on both the exigency of proactive climate policy and the fostering of 21st century technologies and jobs, offshore wind provides coastal state governments with twin opportunities: rectifying the federal leadership vacuum on addressing the global climate crisis and capitalizing on a resource that is profoundly abundant and a major source of private-sector investment and job creation. State policy makers should look to innovations and hard lessons provided by the current state government leaders—Massachusetts, Rhode Island, and New York—and venture boldly forth to seize them. Shiva Polefka is the associate director for Ocean Policy at the Center for American Progress. Quentin Karpilow, Taylor Jones, and Patrick Woolsey of Yale’s Environmental Protection Clinic provided essential research and analysis for this report. Kit Kennedy, director of energy and transportation at the Natural Resources Defense Council, and Luke Bassett and Gwynne Taraska of the Center for American Progress all provided extremely valuable review and policy guidance. Carl Chancellor and Katherine Downs of the Center for American Progress provided indispensable editorial review.